9 Indigenous Prisoners and Zapatista Supporters Free! 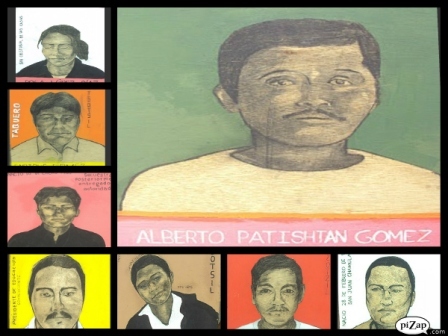 It is the third time that Alberto Patishtán Gómez sees his prison companions leaving, after a long and painful struggle together for recuperating not only their freedom, but also their stolen dignity, the years lost for no reason or crime. It is the third time that he stays inside. That occurred, because nine prisoners and adherents to the Sixth Declaration of the Lacandón Jungle were finally released this afternoon, after three days of waiting for the state government’s decision to be fulfilled. They spent several years constantly in peaceful struggle, a hunger strike, numerous afternoons of loneliness and desperation. They still had to wait for their freedom (rather a correction of the reigning justice system in Chiapas, a warning call). They had one foot in the stirrup since Tuesday, and nothing. Outside, under the rain or the sun, their mothers, wives and/or children waited two days for them, with uncontrollable incredulity. Governor Manuel Velasco Coello arrived by land from Tuxtla Gutiérrez, at 6:15 PM, at the Los Llanos Prison, in San Cristóbal’s rural zone, to deliver the release papers to the indigenous, after entering a los booths and interviewing each one of them. Afterwards, Professor Alberto Patishtán Gómez, who will remain in prison together with Alejandro Díaz Sántiz, went out to the prison gates and crossed over them a few meters to ‘‘deliver’’ those released to their families: ‘‘Here I deliver the compañeros; I still remain here, but one must not lose hope,’’ he said smiling and confident, before making a half turn and reentering the prison, accompanied by the governor and a swarm of officials and escorts. The people that left state prison number five this Thursday are: Rosario Díaz Méndez, Pedro López Jiménez, Juan Collazo Jiménez, Juan Díaz López, Rosa López Díaz, Alfredo López Jiménez, Juan López González and Benjamín López Díaz. Once outside, Pedro López Jiménez said standing at the highway: ‘‘this victory is everyone’s, not just ours and not just yours,’’ directing himself to the indigenous families and solidarity sympathizers from civil society that were waiting for them. Some of them have accompanied the prisoners for many years. ‘‘We will continue struggling. We are not going to stop, much less are we going to abandon Compañero Alberto, who remains inside,’’ Pedro added at the foot of a big rock pie where banners and chants demanded: ‘‘political prisoners, freedom!’’ The people reunited, a few dozen, embraced and greeted with tears the eight men and Rosa, the only woman in the group released, who being pregnant during torture and the unjustified incarceration in 2007, lost a son, among other things. Rosario Díaz Méndez, of the Voice of El Amate, said: ‘‘we will continue struggling until achieving the freedom of Compañero Alberto and all the compañeros that continue as prisoners.’’ He also leaves declaring his innocence. Eight years after the judicial ‘‘error’’ that sentenced him to 30 years for two grave crimes (that he did not commit), his wife did not stop hugging him; they are the oldest couple, the others are young. The nine abandon the prison as the product of years of collective effort, in many countries, on many occasions, above all of those inside the prisons, where the Voice of El Amate and those in Solidarity with the Voice of El Amate became defenders of the rights of the prison population. In the case of Los Llanos, they transformed life inside the prison with their peaceful civil valor. If anyone is going to miss them, it’s the remaining prisoners. A political event has resulted. A victory of the indigenous that, the majority at the mercy of official lawyers (public defenders? ), demonstrated being right and displayed it (their release confirms it) to the police that arrested and also tortured them, to the District Attorney’s agents that jailed them knowing that they were innocent, to the judges that sentenced them, to the politicians that administered the sustained protest of these Tzotziles and Tzeltales from different places. In the evening, the liberated indigenous headed for the San Cristóbal Cathedral, as they had promised, to visit the tomb of Samuel Ruiz García, their Tatic (father).